Kitcheri is a very simple recipe that requires only a few ingredients from the pantry. It's a blend of coral-colored lentils, called masoor dal, with basmati rice and a few other typical Indian spices. It's very nutritious for all the vegetarians in the house. The lentils provide a lot of protein. The key to a good kitcheri though is a flavorful raita, or yogurt sauce. Check back tomorrow for the recipe! Since I have to please a large crowd of vegetarians in the house, I'm always looking for ways to make my dishes more flavorful and nutritious. Traditional Spanish rice is already packed with flavor, so with the addition of just a few ingredients it can become a complete meal. To the standard blend of white rice, onion, tomato, garlic and cilantro, I add protein in the form of cannellini beans and vegetarian chorizo. I finish the dish with a little saffron and Tabasco for an additional kick of fragrance and flavor. For the non-vegetarians, I make a ground lamb chorizo that I add to the Spanish rice instead. This way everyone is happy, and it's not a lot of additional work for me. In cooking, there is a difference between simple and easy. Easy recipes don't require a lot of skill to prepare. Then, there are recipes that are simple: that is to say that there are few ingredients, but the preparation of the ingredients may be very complex. Cooking rice is as much an art as it is a science. I remember watching a program when chef Morimoto talked about how difficult it is to prepare properly seasoned sushi rice. I'm no expert at making sushi rice but I do make a lot of brown, basmati, jasmine and wild rice for my husband. If cooked improperly, wild rice can taste like horse food. But it doesn't have to be that way, I've discovered some method and techniques that will produce a softer, more delicate end product . 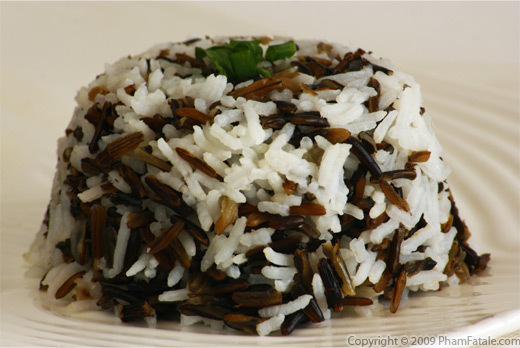 Just because wild rice is good for you doesn't mean that it can't taste good as well. 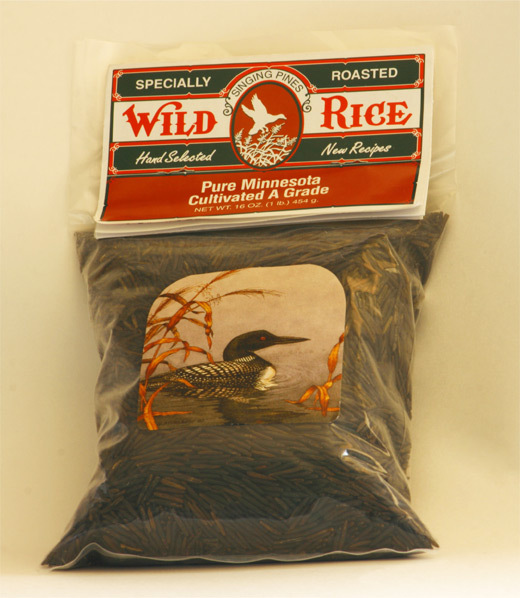 A special note: The wild rice in the picture was given by my father-in-law's friends from Minnesota. 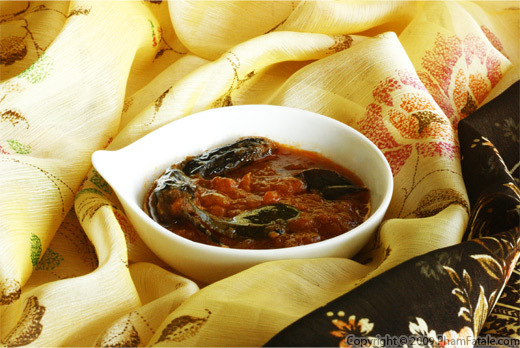 Tamatar Ki chutney is an Indian tomato chutney flavored with fresh curry leaves, mustard seeds and garlic. It's usually served with basmati rice or roti (an Indian wheat-basde flat bread). I love this chutney so much and we make it so often that I usually use the leftover chutney as the base for the tomato sauce in my pasta. I recently used that sauce for my vegetarian lasagna. Since I married Lulu, I discovered a wide range of sauces and chutneys that were totally unfamiliar to me. Lulu's grandma was an amazing cook. When she discovered that I like to cook as well, she was very exticed to teach me all her secret recipes. In most of the world, cooking techniques are orally transmitted from mothers to daughters. I always find it amazing that these recipes, techniques and tips have managed to survive for as long as they have. I feel very fortunate to have learned from such talented cooks like my grand-mother-in-law. 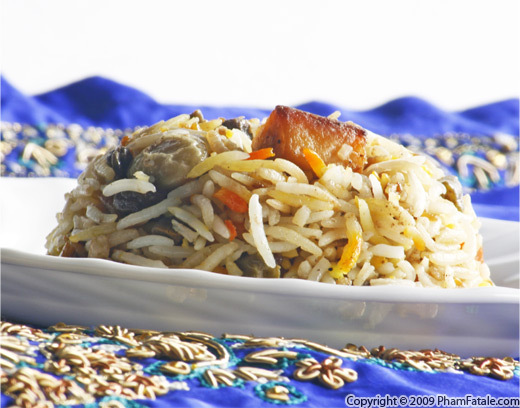 Vegetarian biryani is a vegetable curry with saffron basmati rice. This dish is truly authentic Indian cuisine. I always make Biryani when we have a big crowd at home. Indian food is meant to be eaten by a big group. Paneer is an Indian cheese that you commonly fry and add to rice or vegetables. It is pretty firm and does not melt when heated. The kids love vegetarian biryani and the saffron color brings a nice ...The same dish, when prepared with meat (usually mutton, goat or chicken), is traditional wedding fare. One of Lulu's uncles told me that if he goes to a large Indian function and doesn't get biryani he feels cheated. Page 2 of 10 pages.